Tyler Laundon: For starters, it’s important to recognize that every investor is different. We all have different risk profiles, different amounts of capital to invest and preferences for different types of stocks. My goal with this publication is to run it as I think most investors should manage that portion of their overall portfolio dedicated to individual small cap stocks. It will likely take a few months, or more, for your portfolio to “catch up” with mine after you’ve joined the service. That’s because it’s generally not wise to go out and buy an entire portfolio of stocks all in a very short period of time, no matter how great they are! You’ll want do diversify your investments over time, just as you should diversify between sectors. You should decide how much capital you want to invest in the stocks I recommend (this will likely increase over time as you become more comfortable with the service). Then, either divide that amount by the number of stocks you want to own, or, divide that amount by the number of stocks I cover (side note: I typically cover around 10 stocks, give or take a few depending on whether we’re in a bull or bear market). Either method will give you an average amount to invest per stock. For example, if you have $100,000 to invest in small caps and you want to own (eventually) 10 stocks, you would allocate $10,000 to each position. Next I recommend looking through the current portfolio, paying special attention to those stocks rated “Buy”. You could buy those right away. Then you can buy all the new additions detailed in the monthly Issues as those are released (in all cases, I recommend averaging into a new position with two or more purchases). With each Weekly Update you’ll receive updated guidance on every stock, providing you with ongoing portfolio management guidance as we navigate the market together. Average out your cost basis: It’s wise to average into a new position. For example, one might buy an initial position of 50 shares of a certain stock at $40.00 per share today, for a total investment of $2,000. Several weeks later they make a second purchase of 55 shares at $36.39 for approximately $2,000. The two purchases represent a total investment of $4,000 for 105 shares, at an average cost of $38.10. The strategy helps to reduce the risk of buying a full position in a stock at a poor time (it happens). Take partial profits: If averaging into a position seems to make sense to you then the opposite should as well. I’ll typically recommend that investors sell up to half of their position once we have a capital gain of 30% to 60%. This strategy helps to avoid the heartache of having a nice profit evaporate due to some unforeseen negative event. Allocate more funds to your strongest stocks: There’s nothing wrong with buying more of a stock that is going up. Averaging in doesn’t mean always waiting for a stock you own to fall. Stocks are often momentum vehicles – they tend to continue on their general trajectory (both higher and lower) for longer than investors expect. One of the best ways to increase your profit potential is to simply buy more of what’s working. Follow advice in the Weekly Updates: Please take advantage of all the work that goes into the Weekly updates. My goal with these is to give a running commentary of the potential, and the risks, of each position over time. If you follow along you’re likely to be far more comfortable with your allocation to each position, and you’ll have fewer surprises. 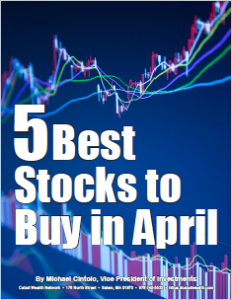 You’ll know which stocks to buy, hold and sell, every week. Plus, you’ll get my commentary on the small cap sector, and how that fits into the context of the broader stock market. Focus on the company, not the stock’s price: A stock’s price is a simple calculation equal to the company’s market capitalization divided by the number of shares outstanding. The actual price of the stock has no bearing on the value of the company whatsoever (the exception is stocks that trade for less than 2.00, and, in some cases, those trading below 5.00). Some investors think a “small cap” needs to have a low stock price. This isn’t true. Many of the stocks I like trade for between 10.00 and 30.00 per share. The fundamental analysis I provide in each Issue will help you to focus on what matters most – the value of the company, not simply the price of the stock. We handle stocks with prices below 2.00 differently because those are typically very, very small companies with lower trading liquidity, and little to no analyst and/or media coverage. In these cases, I factor in variables that contribute to the company’s low price since they are relevant to our investment strategy. I discuss these cases in the Issues and Weekly Updates, as necessary. Avoid big losses: A stock that’s going down often keeps going down for longer than investors expect. There are exceptions of course, especially in the small cap world, where the market isn’t always efficient (this provides us with opportunities!). But in general, investors should keep a close eye on those stocks they own that are gathering downward momentum. Understanding the fundamentals and market opportunities for a particular company helps to increase your chances of knowing whether a decline is likely to be short-term, or long-term. In either event, there is a point at which one has to just step aside to remove the potential for a big mistake. I typically put a stock on red alert when it’s down 25% from the entry point, and once it’s down 30% it’s very likely to be sold. Q: Some small caps have very light trading volume and the bid/ask spread is substantial—especially if the stock is low-priced. If I want to buy $15,000 worth of a 1.50 stock, how do I buy 10,000 shares without dramatically affecting its price? Tyler Laundon: Average out your cost basis with multiple purchases. If a stock is trading below 2.00 you are almost certainly looking for a very large long-term capital gain. With that perspective, you have time to accumulate the stock, and you want to avoid moving the market too much on any given day. Start by looking at the average daily trading volume (I detail this in my Issues), and consider how many shares you want to buy. If your ideal position size represents a significant portion of the daily volume, simply spread purchases out over several days or weeks. Try placing limit orders at prices that are significantly lower than the current share price. The general strategy here is to try to use the relatively poor liquidity in the stock to your advantage. Think opportunistically, as a price maker rather than a price taker. And if you have questions on a specific stock, just email me. We’ll figure it out together. Q: What do you mean by the terms “50-day moving average” and “200-day moving average”? Tyler Laundon: The calculation for determining all moving average lines is the same, whether you’re looking for the 50-day, 200-day, or some other period. A moving average is just the arithmetic mean of the stock’s price over the desired period. The resulting line, which is displayed on a chart along with a stock’s price, can be used to help determine if the stock is strong (trading above the moving average line) or weak (trading below the moving average line). Additionally, these lines often act as support (where a stock stops going down and reverses course) or resistance (where a stock stops going up and reverses course). Accordingly, I often monitor moving averages for each stock and update you in Weekly Updates. Q: What characteristics are you looking for in the individual stocks you recommend? Tyler Laundon: At a high level I’m looking for a “Big Idea”. This is represented by a “pure play” small cap stock that is targeting a very specific investment theme. Pure play stocks focus on one market, as compared to diversified companies (like General Electric) that are involved in many end markets. I’m also looking for a management team that has put together a clear and viable business model for the company. I firmly believe that the development of a superior business model is the biggest factor in determining a company’s long-term success. Accordingly, my analysis focuses on assessing the viability of management’s growth strategies, trends in the company’s addressable market and the achievement of major developmental milestones. Fundamentals matter. Fundamental analysis tells us stories, highlights trends and opportunities, and reveals fundamental flaws. So I dedicate energy to make sure I see positive trends in a company’s revenue, earnings and debt management. Finally, I want to buy a stock when it’s going to go up in the near future. That should be an obvious goal! But it’s still important to evaluate a stock’s near-term upside potential since investors can often be blinded by love of the Big Idea alone, which isn’t always represented in the stock’s trajectory. Q: What advice would you give someone who is ready to start investing in small companies? Stay in your comfort zone. And realize that this zone will grow in time as you become more comfortable investing in small caps. You don’t need to go “all in” on day one. Growing your capital is a year-in, year-out endeavor. Stay grounded. I am always looking for companies that are pioneers in their industry. These are companies that are creating new technologies, winning patents, bringing new products and services to market and building manufacturing plants. The real ones show very tangible evidence of the growth of their company. But there are also a lot of great “story stocks” out there that work very hard to project an image of growth and limitless potential, but fail at every step to deliver results. Sometimes, technologies that sound too good to be true are just that. You need to determine what companies are the real deal, and which are not. And the best way to do that is to use common sense, read every word of my Issues, and do a little reading on your own. I’d rather make a decent return on 80% of my stocks than win big with only 10%. And staying grounded helps come closer to that goal. Don’t discount traditional businesses. High tech is cool. But a lot of very successful small-cap investments come from very basic business models. The corner convenience store, the healthy food manufacturer, the high-volume concrete company, the water refill service … a lot of money can be made by keeping things simple, establishing large positions in small companies with proven business models, and being patient as they grow and/or are bought out by a larger competitor who can improve its own business by a rapid-growth tuck-in acquisition. Invest in stocks that offer both growth and value. Big, growth-oriented ideas are awesome. But it’s also important to consider valuation, and buying when valuation as compared to peers is reasonable. Also, small cap dividend stocks can often add stability and total returns that are comparable to growth stocks. Avoid catastrophic losses by using stop loss limits. A couple of 30% or so losses a year is not a big deal. But allowing those losses to get bigger really does curb the overall profit potential of your portfolio. A word about portfolio management: I believe the best small-cap portfolios favor a high allocation to stable, high-growth companies. Upon that solid foundation, we add strategic purchases of higher risk, event-driven investments. In this way, a solid small-cap portfolio typically generates steady, market-beating returns, and gets some added punch from those stocks that truly go ballistic. Q: What is the sell strategy within Cabot Small-Cap Confidential’? Tyler Laundon: I will look to take partial profits if a stock has gone up between 30% and 60% from my cost basis. That said, I take the company’s growth profile into account, as well as the stock’s technical signals. This means taking profits is handled on a case by case basis. On the flip side, I have a firm stop loss strategy that dictates getting out if and when a stock is down 30%. The idea here is to avoid catastrophic losses that result from becoming too emotionally tied to the idea of getting back to break-even. Q: Do you use stop-losses? Tyler Laundon: Yes. I have a firm stop loss strategy that dictates getting out if and when a stock is down 30%. For stocks that have appreciated, I don’t have a strict trailing stop level. Each performing stock is handled on a case by case basis, factoring in broad market conditions, stock-specific fundamentals, and other relevant information. Q: How does the economic climate factor into your stock picks and outlook on the market? Tyler Laundon: I’m looking for growth, and the state of the economy likely affects the growth potential of specific industries and sectors. It’s important to realize that an attractive company doesn’t operate in a vacuum. For instance, a company selling hardware and software for a connected home will be more challenged to grow when housing is in a downturn than when it’s booming. On the other hand, some industries are consistent almost regardless of the economy. People always need to drink water and eat, so rapid growth food and beverage stocks are always worth looking at. The bottom line is that I put each stock into perspective based on several factors, including the economy, the state of the industry the company operates in, the company-specific fundamentals and the stock’s chart. It’s all relevant, and I try to have more factors working for us than against us since that strategy raises our odds of winning with every stock. Q: What sectors are you most interested in? Why? Tyler Laundon: I like technology stocks because there is always so much growth and acquisition potential in small cap tech stocks. Within technology, I love software companies because of their “build it once, sell it a million times” business model, their high gross margins and their acquisition potential. Hardware companies can be attractive, especially in the area of consumer electronics and networking, but it’s important to recognize these can be boom and bust stocks. I like owning a few biotech stocks, and I like medical device stocks even better because they tend to have more stable growth profiles than drug developers. I also like basic consumer stocks – those that sell water and food products, but are addressing niche markets that virtually guarantee a larger competitor will eventually buy them. It’s fair for you to expect a mix of high-tech and fairly basic investment opportunities in Cabot Small-Cap Confidential. The common thread will always be that I see 100% or greater upside with each stock within a 2-year time frame. Q: You encourage profit taking along the way when stocks are going up. If stock X is up 55%, how do you approach a sale? What percent of shares do you sell? Why sell? When people sell under these circumstances, do they turn around and buy a different stock? Is it always a good idea to do this? Tyler Laundon: I typically recommend selling between 25% and 50% of a position once it has a significant, market-beating capital gain of 30% to 60% or more. Taking profits is very situationally dependent. The underlying strategy is that, much as it makes sense to scale into a stock, it makes sense to scale out as well. Profits that are taken out can be cycled into a new opportunity that looks extremely attractive (if you can’t see any opportunity better than what you own, of course it makes sense to do nothing). This helps to diversify a portfolio and keep any single stock from dictating the portfolio’s long-term capital gain potential. That said, after taking partial profits in very good companies, I like to keep the remaining position for the long-haul. If I have less confidence in the company’s business model, I may recommend selling out completely if I think we can do better elsewhere.